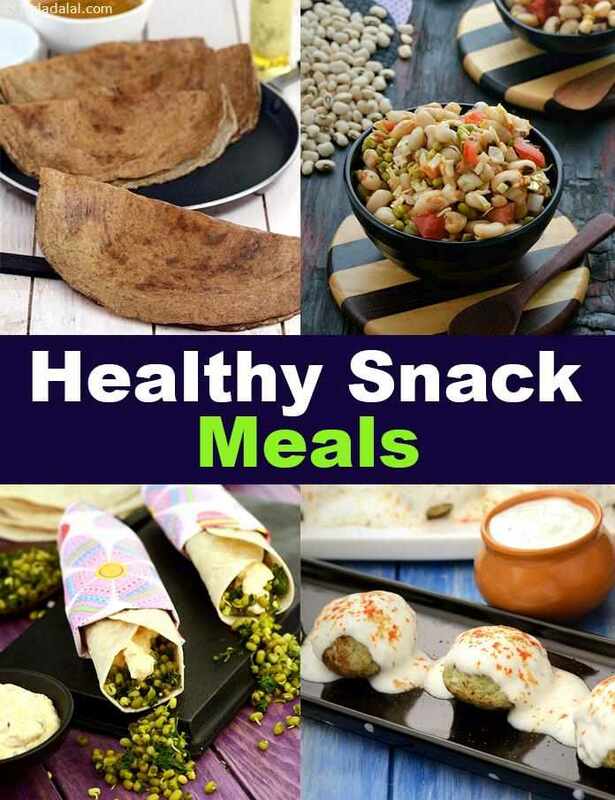 Healthy Snacky Meal Recipes : Veg Healthy Snacks Recipes: Total Health : where Indian health recipes are. When it comes to eating healthily, snacking can be the Achilles' heel that pulls one down. If you are amongst the many people who struggle with the temptation of unhealthy snacks, we have some great tips and ideas to help you with healthier snacking. Snacky meals, for example, are super healthy options to keep you satiated for a longer time to rid the craving for unhealthy snacks. The snacks in this section can make a mini meal, with some healthy accompaniments too. So, when you don't have time for a full-fledged meal, or when you are hungry at an odd hour, do not binge on snacks but reach out for a more wholesome and satiating snacky meal! The 4 flour dosa is quite filling accompanied with some fresh coconut chutney. Bajra, Jowar, Ragi and Whole Wheat flour used in making this dosa will keep you fuller for a longer time compared to a regualr dosa or rava dosa as there is no rice in it. Bajra Carrot Onion Uttapa is again a filling snack as it consists of bajra and carrot. No refined food in this and 73 calories per Uttapa. For those who love chaat, Moong Dal Dahi Vada made of green moong dal, not fried and only 124 calories per Vada. We have lots of Healthy Snacky meal options from Dieter’s Pizza , Club Sandwich , Chawli Sprouted Moong Salad to simple Sprouted and boiled Moong which the ladies love. Amidst drum rolls and lots of pomp, we present a non-fried version of none other than one of the most popular chaats... Dahi Vada. Be careful not to soak the vadas beyond 2-3 minutes, to prevent them from breaking. This is a heavy snack so, I suggest you do not indulge in more than one serving.